Writing, journaling and storytelling are powerful forms of self-expression. They are tools to help you get to know yourself better—and the more you know, the more active a role you can play in your health. Writing is a bit like a meditation—it can help focus your mind, calm your emotions and release tension and anxiety. It can change your mood and help you let go of difficult thoughts and feelings. It can help you reflect on the events of the day or on ongoing problems and issues. It is creative and cathartic. 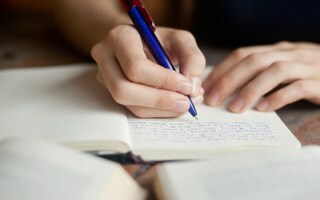 Writing can give you new insights into yourself and your relationships. It can address immediate problems that need to be solved or serve as a spiritual tool to deepen your inner connection with yourself. This can be done in the privacy of your home and no one but you needs to read what is written. The benefit comes from writing it down. Storytelling Performance Events—Nurses participate in workshops with The Moth and perform the stories they create at special events during National Nurses Week. Pulse—voices from the heart of medicine—A free online publication and community that invites patients and healthcare professionals nationwide to share their healthcare experiences through stories or poems. Narrative Medicine for Residents—Sessions every other month allow residents in the Department of Family and Social Medicine to discuss and process their clinical experiences through writing.